If you ever wanted a Chicago Cubs World Series ring and didn’t happen to work for the team, you’ll now have your chance. According to Leland’s, a ring owned by a scout in the Cubs’ organization is now up for auction, and the opening bid was set at $1908. That initial bid, significant for a fairly obvious reason, has long since been exceeded, as the current bid on the ring stands at a shade above $30,000 with 19 days to go in the bidding process. The ring is made from 10 karat gold, and it features 33 red rubies, 72 round white diamonds, and 46 custom-cut blue sapphires, according to Leland’s. 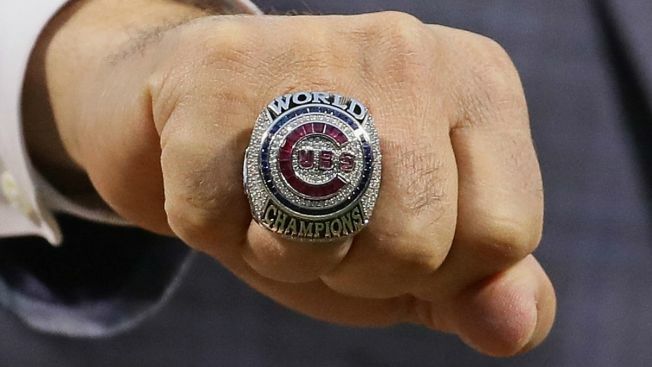 The sale of the ring is somewhat surprising, considering that the Cubs made all employees of the team sign contracts saying that before selling one of the coveted rings, they had to offer it back to the team for the sale price of one dollar. The name of the scout selling the ring has been omitted from the listing to preserve his privacy, according to the auction house.